Emergenza – “Road to Taubertal”! Comments Off on Emergenza – “Road to Taubertal”! Indeed, we’re taking part in Emergenza Festival 2014 this spring. It is an opportunity to play in great places for big crowds, from Helsinki to Stockholm and all the way to Taubertal, Germany. In order to do that, we need your help. Your part is easy: just come to the gigs and vote us forward to the next rounds! 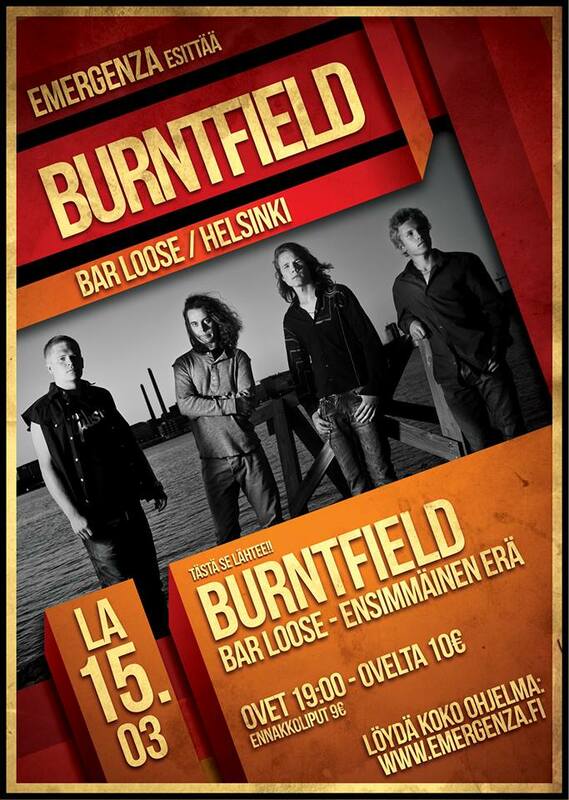 The first round takes place on 15.3 at Bar Loose Helsinki. We will be playing there along with 7 other bands, and half of those bands will advance to the next round in Nosturi. Aaaand for this very special occasion, we have a guest keyboard player Arttu Vauhkonen (Arion), who also appeared on our EP! Stay tuned along this whole shebang by attending the facebook event! Thanks in advance for your support! 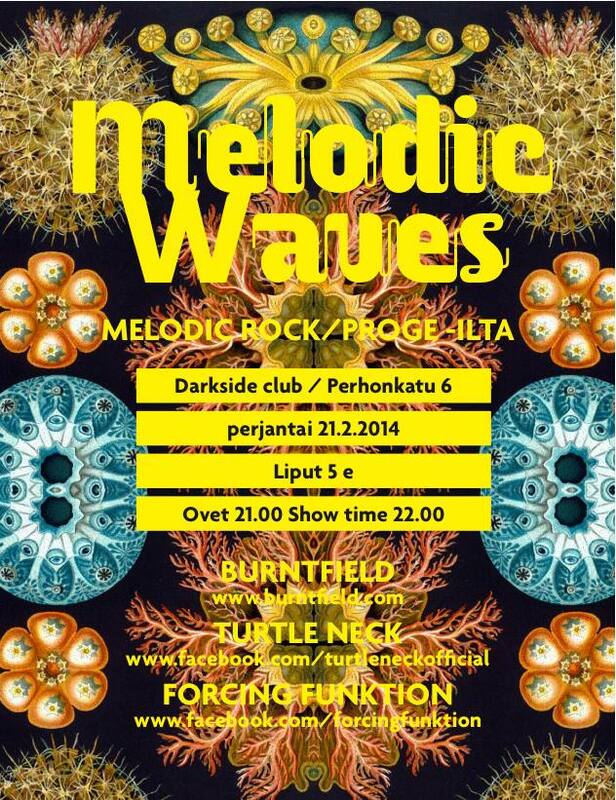 Melodic Waves contest on facebook! Comments Off on Melodic Waves contest on facebook! Time for a quick contest! Share the Melodic Waves event on your wall, leave a comment on our facebook page, and we will draw three lucky ones among those people. 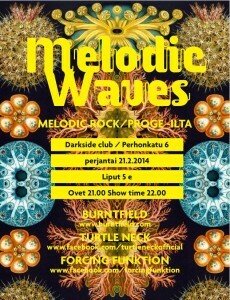 The lucky ones will receive Burntfield’s Organic Waves -EP + a free entrance to Melodic Waves at Darkside Club, Helsinki on Friday! We’re excited to take part in Emergenza Festival 2014. Our 1st step -show will take place at Bar Loose, Helsinki on 15.3. Our showtime is 21:00, the first band starts already at 19:30 and the whole night includes performances from 8 bands total. To make our way to the semifinals and further, we need your help: please save the date, come to the show and vote us! Tickets: 9€ from the band in advance / 10€ door. And to remind you of the upcoming shows… In a couple of weeks we hit the stages at Darkside Club, Helsinki on Friday 21.2. and Club 70, Järvenpää on the following day. In addition of Emergenza, Bar K/Tampere on 5.4. has been added recently. Hope to see you at the shows!